After a pretty lazy week, I was very impressed when I dragged myself out of bed on Sunday morning and headed out in the freezing cold weather for my 14m long run. I was less impressed with myself though when at 3.5 miles in, I decided it was just too cold, I wasn't enjoying myself and there's no way that it was good for me to run in such cold conditions and turned round to head home, so only completed a 7 miler in the end, which really doesn't count as a long run any more. By the time I got home and the weather had got a degree or two warmer, I was really feeling very disappointed with myself for having given up. It's something I always try not to do...if I have aches and minor pains I always try to run through it, and keep going - always keep going - but for some reason I just couldn't do it this time. It was very cold, admittedly, but I passed a couple of other runners who were just in shorts and a sweatshirt who were managing to go along at a decent pace, so why I couldn't manage it, I just don't know. Anyway, I didn't want to let it ruin my training for the week, so the next day (Monday) I tried again - only this time it was minus 5oC when I stepped out of the door. Even colder. But it was beautiful. I very rarely run on a Monday, and if I hadn't had such a disaster on my long run the day before, I probably wouldn't have gone out, but I'm so glad I did. There hadn't been snow, but there was a thick frost and the countryside looked absolutely amazing. I didn't pass another soul while I was out, and there were only a few cars, and it really was one of those amazing runs that I think I'll remember. I didn't go far at all, just 4 miles, but it was enough to really inspire me. 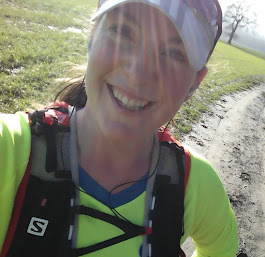 So, my long run was in actual fact a short, uninspiring, disappointment which, as it turned out, meant I had a really enjoyable run yesterday, and now I feel like I'm back on track and remotivated after a couple of weeks of struggling to train.